The project: The Nepean district is home to a vibrant arts community – not to mention the well-known Nepean Performing Arts High School. Given this great interest in dance, music and drama, the community decided they needed a dedicated space for people to practice and perform. The challenge: Artel was engaged by The Department of Education to build a new performing arts centre on the grounds of Nepean Performing Arts High School. Designed to cater to the vocational needs of a range of performers on and off stage, the centre would be used by both high school students and the wider community. The scope: The new facility is a versatile contemporary performing arts theatre, set on 1000m2. Built with a retractable 320-seat mezzanine, it’s large and flexible enough to cater to the diverse needs of all performers. In addition to the main performance space, the centre also features a dance studio, change rooms and a box office. It also boasts a state of the art audio visual system, including a 9-metre wide retractable projection screen. Given its location within school grounds and close to neighbouring properties, the centre also had to take noise into account. Thanks to a complex acoustic wall and ceiling system, sound is contained so nearby properties are not affected by the building’s use. Even sustainability has been considered, with a 40,000L rainwater harvest system integrated into the design – allowing water to be sanitised for re-use in the building and surrounding gardens. The result: Completed within a 12-month period, this project saw some impressive innovations emerge during design and construction phases. 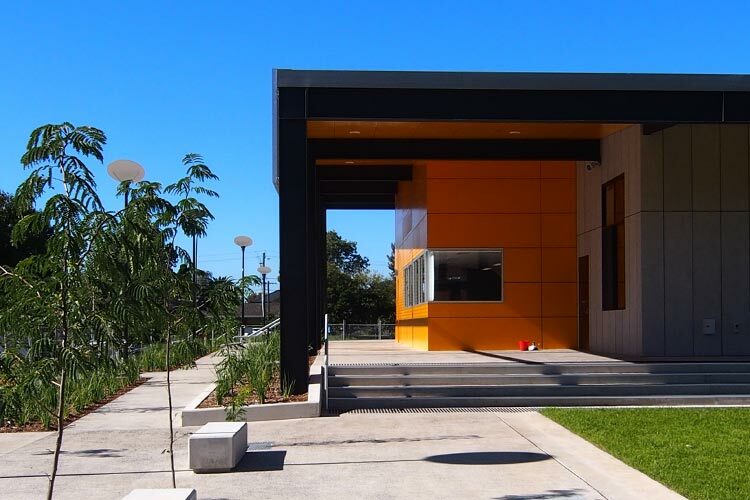 Having set the standard for facilities of its type, it will be used as a model for future educational buildings across NSW.